The best of classroom learning…without leaving the office. Highly interactive, virtual workshops provide the best of classroom learning from the comfort of your office or home. Led by subject experts, this type of online training includes live sessions and joint discussions, as well as take-home assignments and activities. Small class sizes are intentional to allow participants to truly engage with one another through webcams while learning from the instructor(s). Participants log into weekly one-hour live sessions over the span of several weeks where they can see and communicate with the instructor and fellow participants via webcam. Assignments correspond to course materials, which are accessible online 24/7. As a business professional, you’re likely familiar with webcasts and webinars where there is little-to-no interaction with the presenter (phone lines on mute, multitasking screens, etc.). 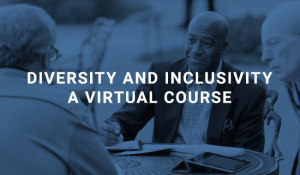 Virtual workshops however, take place live and utilize webcams so participants can truly interact with one another and the instructor while discussing new skills and concepts. This interaction is key to creating a more comprehensive learning experience.